It’s no exaggeration to say that the first week of the 2018-19 NBA regular season was unlike any other that has taken place in a generation. In a total of 39 games played, the average team score was 113.3 points, higher than any full-season total since the 1969-70 campaign, long before any active player was born, including Vince Carter. Teams are playing at an estimated average pace of 102.1 possessions per 48 minutes (via Basketball-Reference.com), the fastest league-wide tempo since 1985-86, when Magic Johnson was dishing assists as an All-Star point guard, not wheeling and dealing as a Lakers executive. Three-point makes and attempts? Both at their highest levels ever, with the 30 teams averaging 11.3 successful threes and 31.2 tries per game. Via NBA.com, New Orleans is scoring a league-leading 127.9 points per 100 possessions, which is a staggering 8.1 points better than second-place Minnesota (119.8). That’s the same immense gap that exists between between Minnesota and 10th-place Charlotte (111.7). Albeit in an extremely small sample size, the Pelicans have the NBA’s second- and seventh-leading scorers, with Nikola Mirotic and Anthony Davis averaging 33.0 and 28.5 points, respectively. 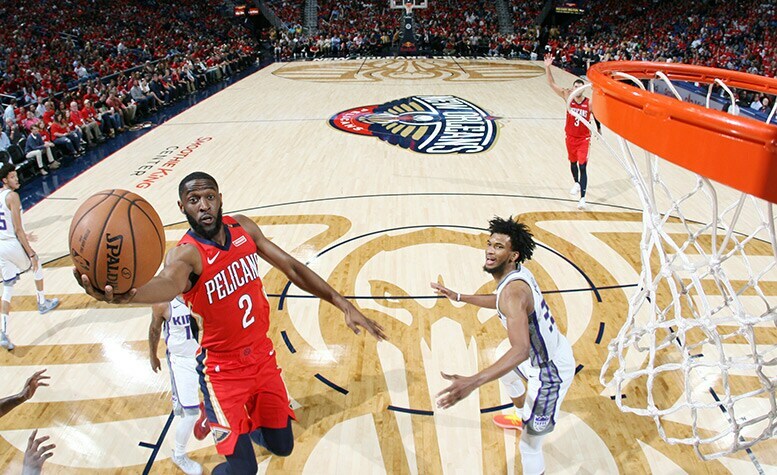 A third New Orleans big, Julius Randle, putting up 19.0 ppg, while four other players are averaging double digits, including reserve guard Ian Clark. Add it up, and New Orleans is averaging a league-best 140.0 points, which is light years ahead of several teams who are also putting up video-game numbers. Sacramento is second in scoring at 125.7, while four other teams are averaging 120-plus. In the last 20 seasons, the ’16-17 Warriors averaged the most points over a full season, at 115.9. As you might expect, the Pelicans are doing damage in a variety of categories, leading the league in field-goal percentage (56.0), baskets (54.0) and assists (35.5). In the latter department, Jrue Holiday (9.0 apg) and Elfrid Payton (8.0) both rank in the top seven individually. Believe it or not, New Orleans (108.75 possessions per 48 minutes, via NBA.com) isn’t playing at the fastest tempo in the NBA, actually third behind the Lakers (112.00) and Sacramento (110.67). But as the team’s new players continue to get more acclimated to Alvin Gentry’s system, that could change as quickly as one of the team’s rapid fast breaks. Last season, the Pelicans finished No. 1 in the league in the stat, but didn’t go full-throttle until after the All-Star break, following a season-ending injury to DeMarcus Cousins. This time, with a full training camp and preseason to install the plan of attack, New Orleans has jumped even from the league-high 101.60 rate of ’17-18. New Orleans is second in the NBA in three-point percentage (46.4, behind only Indiana at 47.1), a number that seems unsustainable, given that no team shot over 40 percent in either of the previous two regular seasons (Golden State was No. 1 in ’17-18 at 39.1). However, the Pelicans have generated a slew of open looks for Mirotic, who is 11 of 17, and eight other players who’ve made at least one three-pointer. By comparison, during Anthony Davis’ rookie campaign of ’12-13, only nine different New Orleans players made a three-point basket all season. The Pelicans approached their all-time record for most three-pointers made in a single game (18) on Friday, when they connected 16 times from deep vs. Sacramento. Defense? We’re sitting here talking about defense?! Eyebrows are always raised when a team like New Orleans allows 112 and 129 points in consecutive games, even in victories, but upon closer inspection, the issue probably isn’t as alarming as it may seem. After factoring in pace, the Pelicans are ranked No. 18 in defensive efficiency (111.6 points allowed per 100 possessions, via NBA.com), certainly not stellar, but also not bottom-of-the-barrel, either. Their two opponents both rank in the top 12 of offensive efficiency, with Sacramento a surprising eighth following a Sunday win on Oklahoma City’s home floor. Following his team’s Sunday practice, Gentry noted that the defensive end is at least one area where New Orleans must get better. In Week 2 of the NBA schedule, the Pelicans will be facing two teams currently in the bottom tier of offensive efficiency (Brooklyn is No. 21, Clippers are No. 26), with a third near the top (Utah is No. 5).